Florida’s massive Lake Okeechobee is a huge responsibility for the U.S. Army Corps of Engineers. The Corps is in charge of about everything having to do with it, and the decisions it makes has potential effects on a slew of stakeholders. The Corps’ Jacksonville District oversees the operation of the lake and the Okeechobee Waterway Project – part of a water management system known as the Central and Southern Florida Flood Control Project. Lake Okeechobee issues are important to the Seminole Tribe for many of the same reasons they are to anyone else, but also because the Brighton Reservation isn’t far from proposed infrastructure projects that are currently in the study phase. Those projects include aquifer, storage and recovery (ASR) wells and a so-called “shallow storage” water project. John H. Campbell, acting chief in the Corps corporate communications office, told the Seminole Tribune March 20 that more information regarding those projects was expected to be updated soon. 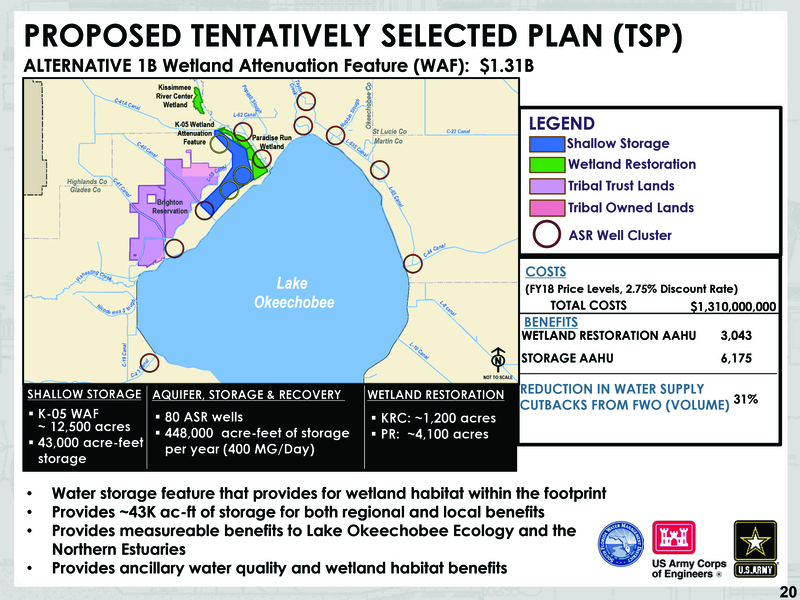 The water storage project is not being called a reservoir, but a “wetland attenuation feature.” During heavy precipitation, it would help attenuate flows into Lake Okeechobee, Campbell said. The Corps held three public meetings on the projects in the summer of 2018. Campbell said no construction has taken place so far. “We’ll have more info in April for what the road ahead will look like,” Campbell said. In addition, he said the proposed projects would still have to be authorized by Congress for funding appropriation approvals, putting any construction months to years away. The development phase of the projects came to the fore in 2016 as a way to slow some of the water coming into the lake without storing it for long periods of time. The Tribe wants to make sure it doesn’t encroach too closely to Tribal lands or have any negative environmental impacts. “There is still coordination to do internally and externally,” Campbell said, including updates to Tribal leadership. Corps officials have been traveling the state in recent months to hold public “scoping” meetings to develop a new Lake Okeechobee System Operating Manual (LOSOM). That infrastructure includes the Herbert Hoover Dike rehabilitation, Kissimmee River Restoration Project, as well as the Comprehensive Everglades Restoration Plan, which includes two reservoirs and a storm water treatment area. Officials are asking themselves and the public key macro-level questions like: How do we want to run the lake in the coming years? What issues are important? What outcomes do you want? How would you measure success? The new operating manual, which is not intended to propose new infrastructure projects, is a four-year effort that includes planning workshops and evaluations followed by draft reports and other public comment periods. The Corps expects a final report by 2022. There may not be an issue in Florida more complex and more politically confounding than Lake Okeechobee and Everglades restoration – which are both intrinsically intertwined. Restoration efforts have been underway for almost two decades with minimal results. There are huge environmental and economic impacts at stake, including flood risk management; water supply; agricultural irrigation for the Seminole Tribe, municipalities and industry; navigation; enhancement of fish and wildlife; and recreation. The more dire issue over the past year or so has been the toxic green algae bloom and red tide that has particularly affected the west coast. The red tide, thought to be exacerbated by industrial fertilizers, makes its way from lake discharges and heads east and west through tributaries. The red tide and algae blooms have killed untold scores of fish and other sea life including manatees and dolphins. The problem has gotten the attention of residents, tourists and politicians – including Gov. Ron DeSantis and Republican Congressman Brian Mast. Mast sends out an almost daily video and email update about the lake and the “toxic discharge situation,” particularly as it affects his constituents who live in an area stretching from Fort Pierce to Palm Beach. DeSantis made lake issues and Everglades restoration a big part of his campaign and that has continued through his early days in office. The South Florida Water Management District also issues regular Lake Okeechobee email alerts to subscribers. Complicating the specter of any lake projects being completed in a timely fashion are both the recent government shutdown and President Donald J. Trump’s 2020 budget proposal. The Miami Herald recently reported that Trump’s budget slashes spending by the Corps by 31 percent. The budget also did not include funds for an Everglades reservoir that was aimed at reducing that polluted water flushed from the lake to coastal estuaries. The proposal did include $63 million to help restore Florida’s wetlands and other ecosystems – including money to complete reservoirs east and west of the lake, including the restoration of parts of the Kissimmee River. But the $63 million is also well short of the $200 million DeSantis and legislators had requested for Everglades work. Trump’s budget also left out a 17,000-acre reservoir south of the lake to reduce polluted discharges. Corps officials recently said the 17,000-acre reservoir was left out of the budget because the SFWMD never made a formal request for it. SFWMD spokesman Randy Smith said no formal request was made because the state budgeted $64 million for design efforts. The SFWMD’s governing board recently was overhauled at the behest of DeSantis. For its part, the Corps says it’s focused on completing projects that are already in work. Meanwhile, the reservoirs themselves are not without controversy. The Corps and others have questioned whether the 17,000-acre, 23-foot deep reservoir and its filtering marshes can even get water clean enough to pump south into Everglades National Park. Original reservoir plans had called for a 60,000-acre shallow reservoir, but Florida lawmakers shrunk it by a third and ordered the SFWMD not to seize more land. The public meetings hosted by the Corps this year have brought out more than 2,000 people, according to Erica Skolte, public affairs specialist. At a public meeting held at the Broward County Main Library Feb. 26, there was a crowd of about 45 people. Concerns related to the lake and its discharges that were brought up including effects on public health, real estate, tourism, drinking water quality and the overall health of the environment. Public meetings and commenting were held throughout February and were set to end on March 31. However, the Corps recently decided to extend the commenting period until April 22, although the last public meeting was held in Key West on March 22. Previous meetings were held in Lehigh, Okeechobee, Clewiston, Stuart, Fort Lauderdale, Miami Gardens and West Palm Beach. “We heard a lot of feedback regarding the priorities and concerns of people from all around the lake,” said Lt. Col. Jennifer Reynolds, Corps deputy commander for South Florida. Comments can be submitted through April 22 by email at lakeocomments@usace.army.mil, or by mail to Dr. Ann Hodgson, U.S. Army Corps of Engineers Jacksonville District, PO Box 4970, Jacksonville, Florida, 32232-0019.